@WandelStock Many hours of minecraft and bitcoin mining lets me take blocks out of anything made out of digital matter. @FimbulFlower @KitRedgrave Wow. I love how it's just the alpha channel so that it matches every potential background color. @FimbulFlower FOR HORUS SAKE! YOU BROKE THE REALITY AGAIN?! 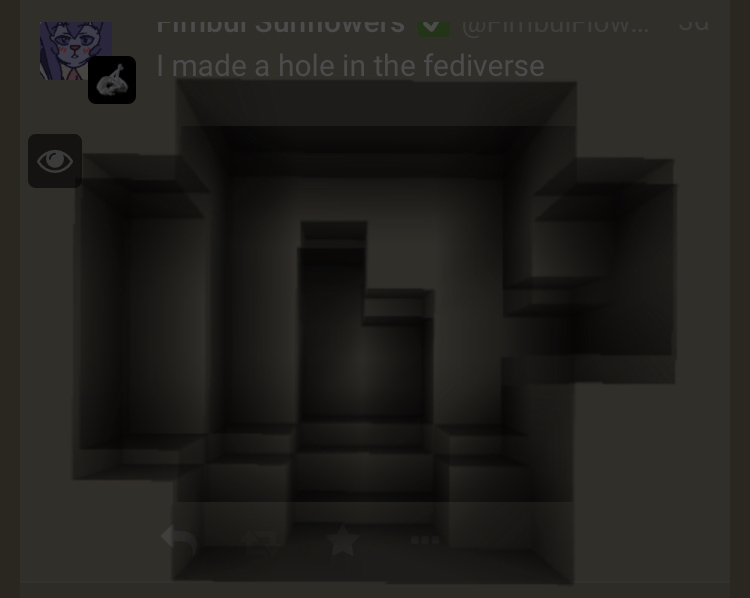 @FimbulFlower this is a hole new fediverse right there. – Where's the cat ? – And the neighbours ? – They're in the hole. – Oh my god call the police ! – And where are they ? – How deep is even this thing ? ! @FimbulFlower this hole pointed at @scarlett. @scarlett @FimbulFlower because of the scale of my window, and because you where in the correct place in my mentions. this is really funny on mobile with a dark theme, because it just shows nothing.